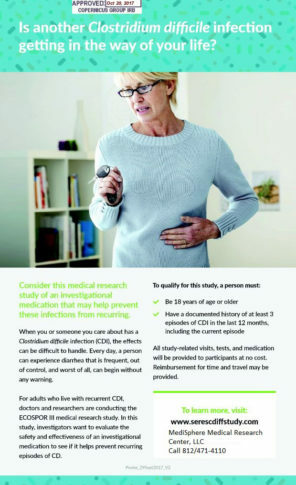 For adults who live with recurrent CDI, doctors and researchers are conducting the ECOSPOR III medical research study. In this study, investigators want to evaluate the safety and effectiveness of an investigational medication to see if it helps prevent recurring episodes of CD. Are you diabetic and have symptoms of nausea or vomiting, abdominal pain, bloating, or early fullness after meals? 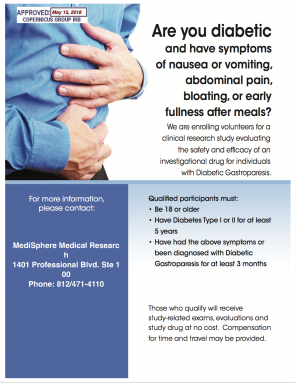 We are enrolling volunteers for a clinical research study evaluating the safety and efficacy of an investigational drug for individuals with Diabetic Gastroparesis. Men and women age 18 or older. Must have Diabetes Type I or II for at least 5 years or have had the above symptoms or have been diagnosed with Diabetic Gastroparesis for at least 3 months. 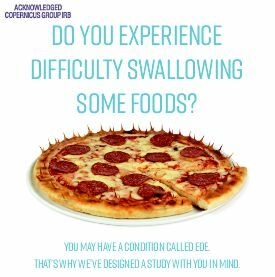 Do you experience difficulty swallowing some foods? You May have a condition called EOE. That’s why we’ve designed a study with YOU in mind. We are looking for volunteers who are 18–75 years of age and have been diagnosed with eosinophilic esophagitis (EoE).